Normally, we wouldn't pick at the edges of such a translucent title, but this one's super-interesting, so we're picking: CVG say they have some details on Warren Spector's Disney game. According to their sources, the game is indeed a Wii exclusive, and you will "paint your way through levels using the Wii Remote", doing things like drawing and erasing "whole parts of levels". 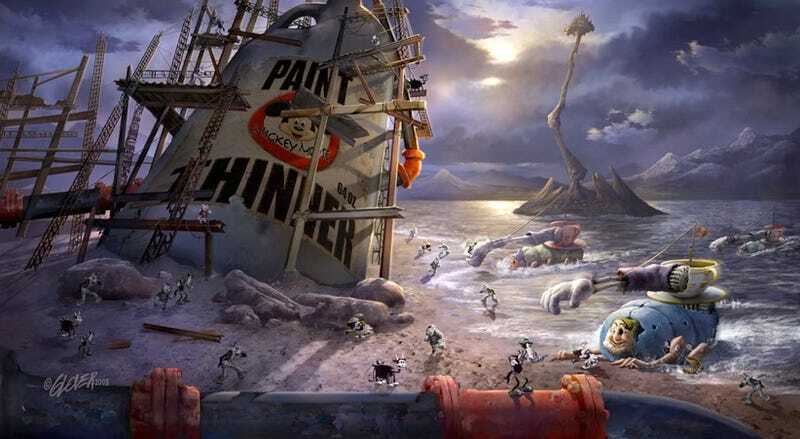 It'll be based around a story where Disney's lesser, forgotten characters rise up against Mickey, which would explain the emphasis on hot military action seen in the game's concept art. Bear in mind we've yet to receive any kind of word on this game from Disney, so you may want to take it with a pinch of salt. Well, this info, at any rate; we're pretty sure the art is for real.